After talking with the Kenan family, the University has decided to change the football stadium's plaques to remove the honorific reference to William R. Kenan, Sr., to focus instead on the donor who made the gift, William R. Kenan, Jr.
Today I write to you about three aspects of Carolina history, all with deep roots in the past and very much with us now, in the living moment. First, the Confederate Monument. Thank you for your thoughtful suggestions about its future. Faculty, students, and staff have organized forums for more input in the next couple of weeks. This is not going to be easy. But I am confident the Board of Trustees and I will have a strong plan to present to the Board of Governors by the November 15 deadline. Disputes around this monument are deeply rooted in race, inclusion, opportunity, pride, and memory that we, our state and our country still struggle to resolve. As much as we love Carolina, confronting our full history is hard. That journey begins long before the founding of our nation, and includes slavery, war, suffrage, immigration and civil unrest. And of course, it also includes the hope, freedom, progress, learning and life-changing discoveries that so many associate with Carolina. We must not only examine our history but live it, create it and take our next steps with integrity, if they are to stand the test of time. If done well, the choices we make now will help us to come to terms with those deeply rooted issues, and move us forward in our struggle for resolution. Second, I want to let you know that we are actively working to contextualize the names of buildings and places on our campus, beyond the recent efforts with Carolina Hall and McCorkle Place. In 2015, at the request of the Board of Trustees, I commissioned the History Task Force to help us research, curate, and teach a full history of the University. They are working hard to research the historical context of the names — some of which originate in periods of enslavement and Jim Crow that can be painful to acknowledge in the present — and we will share their newest work on McCorkle Place at University Day. Yet in reckoning with our past, we must not overlook the good works of people living in the present. 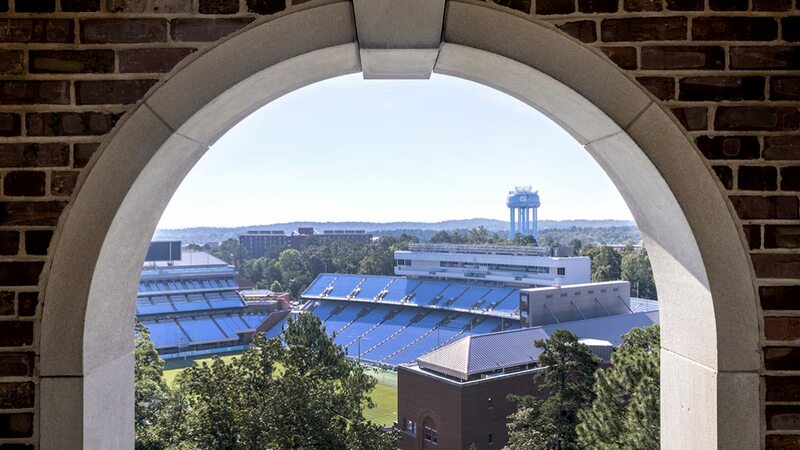 As a university founded in 1789, many families from those times are represented across our landscape, and many of their descendants live in North Carolina, study or work on our campus, and make outstanding contributions to the welfare of our University, state and nation. There may be no better example of this than the Kenan family. Like so many in this community, I have had the honor and privilege to know this generation of Kenans. The University and the State of North Carolina have benefited enormously from the Kenan philanthropy of the last 100 years. For some, the most public symbol of their generosity is Kenan Stadium, which bears plaques in memory of William R. Kenan, Sr., a leader in the Wilmington insurrection of 1898. I am pleased to report that after talking with the family, the University has decided to change the plaques to remove the honorific reference to William R. Kenan, Sr., to focus instead on the donor who made the gift, William R. Kenan, Jr., and to tell the full and complete history. The History Task Force will undertake this project in the coming weeks. Here too, we must acknowledge the realities of the present and the past. In the case of the Kenan family, their present impact has included helping Carolina build and retain a world-class faculty, a leading business school, a cutting-edge arts and music environment, as well as helping our university attract underrepresented populations into STEM fields and rural medicine, just to name a few. In fact, their generosity is not limited to Carolina, but has improved people’s lives at other universities and in communities across the state. As we move forward, we will look just as carefully at all other names memorialized on our campus. Finally, on October 12, we will celebrate our University’s 225th birthday — and the birth of public higher education in America. Supported generously by the people of North Carolina, alumni, and other benefactors, a bold and exciting future is emerging from our transformative history and our core public mission, Lux et Libertas.